I am 22 when it first occurs to me that migraines will impede my projected path through life. It is the first week of my first real job. My business card says Rural Reporter, which distinguishes me from the Education Reporter and the Business Reporter and the Crime Reporter, but really we are all rural reporters, at a tiny newspaper in a town you’ve never heard of, tucked away in the foothills of the Washington Cascades. Thanks to a nearby spearmint factory, which refines the sweet oil used in candies and toothpaste, the whole town smells like a pack of gum left on a car dashboard on a hot summer day. I find myself on a tour with two women from the local chamber of commerce. I am riding shotgun in an oversized Cadillac, nodding dutifully as they point out the sights, but the mint smell, suddenly unbearable, overwhelms me. The sun lasers through the windshield and into my eyeballs. The pain begins to pulse. In a few minutes, it has surged across the left side of my head. My stomach clenches. After a few more minutes, I can muster no more enthusiastic nods. We are just passing the mayor’s house when I ask to pull over. I have years of practice at making hasty retreats to bathrooms or secluded trash cans. Sometimes I travel with a wadded grocery bag in my purse, or one of the sleek, wax-paper barf bags I collect from airplane seat pockets when I fly. But today I have no bag. I barely have time to scoot off the Cadillac’s leather seat and step onto the mayor’s lawn. I have no time even to crouch. I puke standing up, which I know means there will be a backsplash. It hits the ground, splatters my black loafers and trails up the hems of my good black pants — formerly my interview pants, recently promoted to work pants. I explain to the ladies from the chamber of commerce that I get migraines, and that bright lights and strong smells sometimes trigger an attack. They nod at me blankly while I wipe my shoes on a clean section of grass. Then they drive me back to the newspaper office, where I sheepishly tell my new boss that I have to go home and lie down, that I probably won’t be back for another two days. I don’t even know whether I have sick time yet. All I know is that I need to find a dark room and curl up in it. He tells me to go. •••More than 36 million Americans suffer from migraines, but because a staggering 27 million of us are female, the disorder is largely relegated to the dusty medical designation of “women’s issue.” It gets short shrift when it comes to research funding: this year’s National Institutes of Health budget includes $458 million for alcoholism research, $230 million for asthma, and $219 million for tuberculosis — but only $18 million for migraines. Even among neurological disorders, migraines get less funding than devastating but much less common disorders such as Parkinson’s ($155 million), which affects roughly one million Americans. As a result, migraines are simultaneously one of the most common and the least understood disorders of our day, with startlingly limited treatment options. Dr. Audrey Halpern, a neurologist and migraine specialist who teaches at the New York University School of Medicine, is stunned by the low priority placed on migraines — especially considering that nearly one in five women is regularly sent scuttling home from work, or puking on her pants, because of them. Today there is no doubt that migraines are neurological, although the specific cause remains murky. Most doctors believe the condition is genetic and related to some structural or chemical dysfunction in the brain. And that dysfunction may not be the same for men and women. A recent study of migraine sufferers of both sexes by Harvard researcher Nasim Maleki found the women’s brains so different from the men’s that their migraines were essentially “different diseases altogether.” In women, the areas of the brain responsible for motor processing and pain perception were much thicker and more interconnected than for men with migraines, or for non-migraneurs male or female. Studies like Maleki’s are important, but few and far between. As of now, doctors haven’t advanced very far beyond the physicians of the Middle Ages, who drilled holes in the heads of migraine sufferers to release the evil spirits banging around inside. For sufferers, sometimes, it still seems like a pretty good option. Compare migraines to breast cancer, another prominent “women’s issue” that does get a fair amount of funding. Halpern explains that this may be partly due to the fact that breast cancer is potentially fatal, and partly due to the prevailing bias in the medical community for definitively diagnosable disorders. A tumor, after all, will show up on an MRI. A migraine will not. It can only be diagnosed by listening to a patient who says she is in pain — and believing her. Everyone’s a skeptic: most people who hear the word “migraine” translate it to “headache,” and expect us to take an aspirin and get back to work. They sometimes assume we are ignorant or unable to care for our own minor health problems. I have had bosses, teachers, and coaches urge me to exercise more, rest more, drink more coffee, drink less coffee, avoid milk, avoid gluten, avoid citrus, try acupuncture, see a chiropractor, inhale lavender, or press the spot on my hand between thumb and forefinger. I’ve tried all those things, along with everything else. •••Migraines inflict pain by making blood vessels around the brain swell up like so many pythons swallowing hippos. When I feel one coming on — it happens once or twice a week — I take medications that constrict my blood vessels. These are sometimes effective and sometimes not. When a migraine withstands medication, it will last for 48 bedridden, anguished hours. In a dark and preferably cold room, I lie as still as possible to keep from startling my stomach, which, like a wild animal, is easily provoked by sudden movement. Some people have had luck with preventive medications, but most of these are repurposed drugs, originally introduced in previous decades for entirely different disorders. I have taken drugs initially intended to treat, in turn: seizures, high blood pressure, depression, cardiac arrhythmia, anxiety, angina and psychosis. None made a dent in my migraines. I have also volunteered for three different clinical trials of new (or newly repurposed) migraine medications. Two had no effect; one had the effect of waking me in the middle of the first night I took it, feeling like I had been kidnapped by carnies and strapped to a Gravitron floor. The intensity of that vertigo, which pinned me to my bed and prevented me from even being able to speak, was one of the few experiences in my life worse than getting a migraine. I dropped out of the study the next day. Nobody likes that guy, I know, especially when she’s a woman. I have seen the eye rolls. I know there are no flattering portrayals of migraine sufferers on TV or in movies. In fact, screenwriters seem to use invisible, chronic ailments like migraine as shorthand for neurosis. The movie Sleepless in Seattle annoys me, in part, because I identify with Meg Ryan’s jilted fiancé, who suffers from severe allergies and never wants to do anything fun. The latter symptom seems to cause the former: we are led to believe that if he were more interested in fun, he wouldn’t have gotten himself a medical condition that precludes it. We are supposed to root instead for Tom Hanks, who is, it seems, immune to such ailments by virtue of his more lively personality. There can be no romantic comedies with a migraine-troubled heroine. What if Ryan’s Annie was supposed to meet Tom Hanks at the top of the Empire State Building but found herself instead stuck puking in the bathrooms at Grand Central Station? I have puked in those bathrooms. It is not cinematic. Over time, I have reconciled myself to seeming a lousy character. I have not yet reconciled myself to being a lousy friend; the kind who might not make it to your wedding or show up to walk your dog while you are on vacation. These days I hardly ever make firm plans in advance, so I won’t have to cancel at the last minute and let someone down, again. This is the best response I can hope for: that instead of trying to cure me — Try feverfew! Vitamin D! 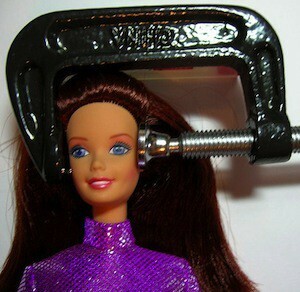 Brain surgery! — the people in my life will simply accept my migraines and try to help me cope. I understand the desire for a simple fix. I’m still struggling to accept my migraines, too, still fighting the way my world shrinks around me when I acknowledge the limitations they impose. Despite my boss’s understanding, I am eager to prove myself on the job. My next migraine coincides with my assignment to cover the Toledo (Washington) Cheese Days Festival. I find myself standing again under a blazing sun, watching people parade through town dressed as wedges and wheels of cheese. Fortunately, the parade route is dotted with blue metal trash bins. I make a beeline for these between interviews. At the parade’s end, I am offered a cheese sandwich. I decline, and race home to file my story from a cold, dark room. Jennifer Latson is writing a narrative nonfiction book about a genetic disorder called Williams syndrome, which makes people socially uninhibited and indiscriminately friendly. She tweets at @JennieLatson.